The Snoqualmie Valley Trail offers the opportunity to get out, in any season, and explore one of the most beautiful agricultural valleys in the region. The trail parallels the Snoqualmie River and occupies the historic path of a spur line of the Chicago, Milwaukee, St. Paul & Pacific Railroad. At 31 miles in length, the Snoqualmie Valley Trail is the longest regional trail in King County. This itinerary takes you from Snoqualmie to Duvall, a 20-mile one-way bike ride. It also connects you to the historic downtowns and parks along the way to make the most of your day trip. Use our Snoqualmie Valley Trail map as you navigate throughout your adventure. To do a one-way bike ride, you’ll want to park one car in Duvall. Head to Depot Park, just a block off Main Street and a few feet from the Snoqualmie Valley Trail, to drop off a car. You can walk up to Main Street to grab a warm beverage or anything you may have forgotten. For bike needs you can visit Pacific Bike and Ski. Next, drive south on Highway 203. At Fall City take the second exit off the roundabout to get onto Highway 202 south and continue for another few miles. Just past Snoqualmie Falls you’ll get to a roundabout. Take the third exit onto Tokul Road. After about 3,000 feet you’ll see a small pull-off to the right. The trail goes under Tokul Road here. You’ll park here and will need to navigate down a short but steep hill to get to the trail. Once on the trail start heading north. After about 3,000 feet you’ll arrive at the Tokul Trestle a century-old wooden train trestle that spans a 400-foot-wide gorge and sits 120 feet above Tokul Creek. This is a great photo spot! Continue your ride north as you wind your way down through the beautiful forest. After about 5 miles you’ll get to a connector trail for Fall City you can either continue your ride or take a 2-mile round-trip detour into Fall City. The connector trail will take you into Fall City Park which is just across the river from the downtown. For a side trip you can guide yourself through the Fall City Historic Signs Walking Tour. Continue north on the Snoqualmie Valley Trail towards Carnation. As you get closer to Carnation you’ll see the landscape begin to change, with glimpses of farm fields through the trees, turning into wide open fields on both sides as you get to Remlinger Farms just before crossing the Tolt River. Just after crossing the Tolt River take a left to get on the trail to Tolt MacDonald Park. Tolt MacDonald is a 576-acre park and a popular spot for camping, hiking, and picnics. While you’re there you can check out the 500-foot suspension footbridge. 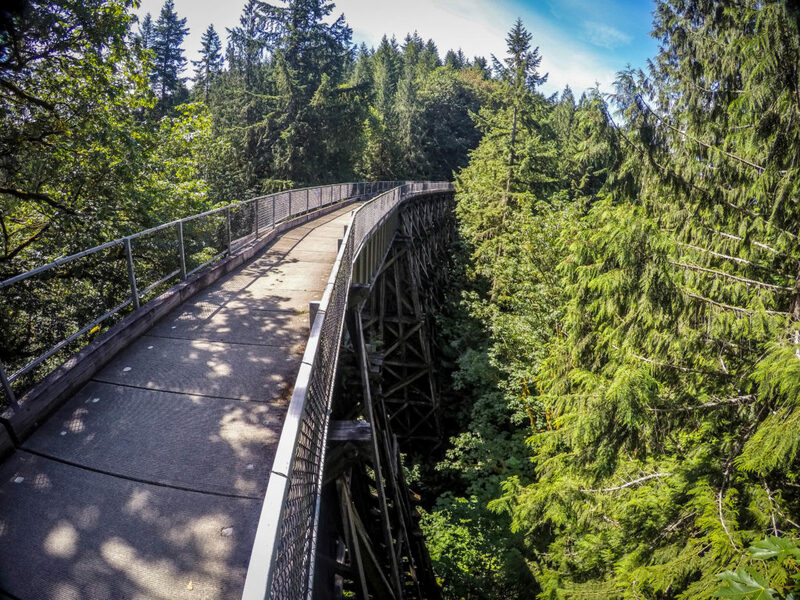 The bridge spans the Snoqualmie River and leads to miles of forested trails. Make sure to stop on the bridge and look through the art scope to see a holograph of the old bridge. Take the connector trail located next to the ball fields that leads into Historic Downtown Carnation. You can grab a bite to eat or check out some of the fun, local shops like Tolt Yarn and Wool. To get back to the Snoqualmie Valley Trail head east four blocks on Entwistle Ave. Continue heading north towards Duvall. The trail is mostly flat for the remainder of the ride with lovely views of farm fields and wetlands. After about 3.5 miles you’ll cross through the Stillwater Natural Area. This 456-acre preserve is managed Washington Department of Fish and Wildlife for hunting, wildlife conservation, and wildlife-related recreation. Continuing north on the Snoqualmie Valley Trail you’ll enjoy alternating views of the Snoqualmie River and farm fields. After about three miles you’ll get to a bigger road crossing of NE 124th Street. For a short detour, stay on the south side of the NE 124th and head west. Just 600 feet off the trail is the Local Roots Farmstand. This farmstand is open year-round (except for if there’s flooding) and is a great spot to pick up local produce. You can drop cash or a check into their box to pay for your goodies. You can also check out the farmstand’s Facebook page to see what’s stocked inside. Continue north on the Snoqualmie Valley Trail to reach your final destination. After about two miles you’ll reach Depot Park and your car. Before you pack up be sure to check out McCormick Park, which is just off the trail, and enjoy a few minutes sitting along the bank of the Snoqualmie River and reminiscing about your ride. You can also head back into Historic Downtown Duvall to enjoy a walk through town or to grab a bite.